I am sorry I could not be a father for you, to help you grow and explore and understand this world. I wish I could watch you discover and learn what it means to be a man of God, what it is like to truly love, and the great gain that comes from surrender. You helped me discover what it is to love one you never knew, and know just how deep the love of a father is for his child. I wish you could see the love that your mother has for you. I wish you could hear the songs that she would sing, and the melodies she would compose celebrating your every moments – the special moments, and all of those in between. Even though I could not be your father, I am glad that you are in the arms of our heavenly father. His love is the love I would have strived to live up to for you. Let him show you quiet strength, perfect forgiveness, and grace in the face of injustice. I pray that your little brother or sister will know even the smallest measure of the love that you know on this day. I pray that tears of mourning can yield slowly to tears of joy. While we are overjoyed with bringing your little brother or sister into this world, we cannot help but remember and mourn you today, this anniversary of losing you. We loved you as soon as we knew you were there and made plans for you and had hopes and dreams, but they never came to fruition. I wish I could have held you in my arms just one time. I wish I could have looked into your tiny eyes and held your tiny hands. I wish I could have seen your first steps and heard your first words, but Jesus had another plan. I don't understand why God chose to take you home before you could meet us and we could meet you, but He did and I know you are with Him now. I look forward to the day I get to Heaven and have you waiting for me. At that time, I'll be able to hold you for the first time. I miss you, though I never knew you, and cry for you today. Thought I would add it a little more info about our appt and the picture. We found out I'm 8 1/2 weeks along and the due date is my birthday! (August 29) The little circly thing you see in the upper right side of the photo is the yolk sac. It will provide nutrition to our baby until the placenta fully develops. SO cool, eh? We started trying for a baby last September, succeeded in November of last year, and miscarried in January of this year. It was devastating and it took 6 months for my hCG to drop down to a safe level to start trying again. We've been trying again since June and about two weeks ago, I started feeling queasy. Knowing I had gotten my hopes up every month since trying, I really tried to not get them up this time. Perhaps I was coming down with something. Tis the season afterall. But then I started getting more and more symptoms more specific and pretty soon, I KNEW I was pregnant, even though it was too early to take a test. Well, Monday rolled around...day 29 of my cycle (note, mine is not regular, so...yeah). So I took a test, fully expecting it to be positive and...it wasn't. WHAT? How could this be? My test must be broken. So after work, went and bought some line tests and got a blood test at the doctors. Then the line test was negative too and I snapped. Emotional breakdown. Cried myself to sleep and started crying as soon as I woke up on Tuesday. Couldn't function. Just sulked all day. Wednesday, I was supposed to get my results from Monday's blood test, so I figured...maybe...just maybe...it was too early. So I took another line test. It was POSITIVE! AHHHH! Monday's blood test was negative, but after researching Qualitative Blood hCG tests and finding out that one is no more accurate than a pee test, I expected it. Took another on Thursday: Positive and ran out except for the digital, which I wasn't ready for yet. Bought another test (a +/- for a different kind) and took it yesterday morning: Positive. Took the digital right after: POSITIVE! 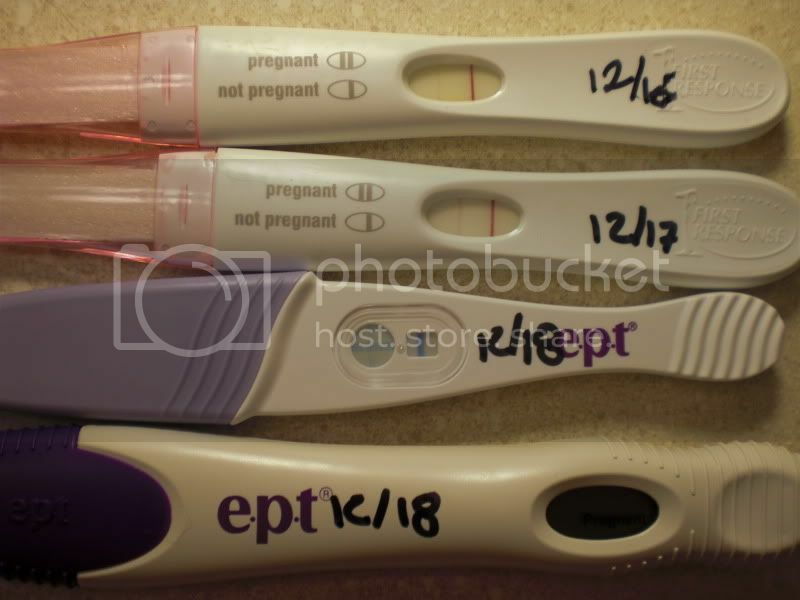 To me 4 positives on 3 different types of tests with 2 different brands=PREGNANT! Our first appointment with the OBGYN is on January 20 and we are both just psyched!